2007 Ironage Reunion and Chuck Sipes Award to Roland Kickinger. The first ever Ironage dinner was held in Columbus, Ohio on March 1st, 2007. 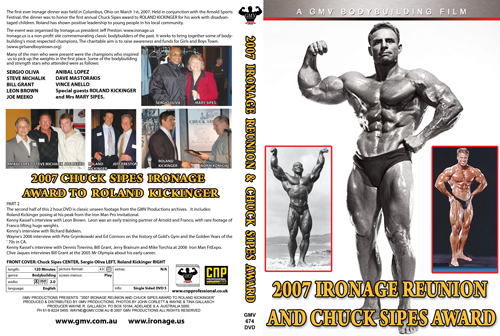 Held in conjunction with the Arnold Sports Festival, this groundbreaking charitable event kicked off festivities for many ironage fans at the 2007 Arnold weekend. In particular the dinner was to honour the first annual Chuck Sipes award to ROLAND KICKINGER for his work with disadvantaged children. Roland has shown positive leadership to young people in his local community. Held at the interestingly named Frog, Bear and Wild Boar Bar the event was organised by Ironage.us president Jeff Preston. Founder of Ironage.us Shawn Perine was unable to be present due to airline problems which delayed his arrival. Ironage.us is a non-profit site commemorating classic bodybuilders of the past. It works to bring together some of bodybuilding's most respected champions. The charitable aim is to raise awareness and funds for Girls and Boys Town. The profits from the DVD will go to this charitable foundation. Special guests ROLAND KICKINGER and Mrs MARY SIPES. See our SPECIAL TRIBUTE TO STEVE MICHALIK here. During part of the proceedings the classic old Mr Olympia films shot by Norm Komich were shown on the big screen. GMV Productions was there to record the speeches and camaraderie of the occasion. Speakers included Jeff Preston, Bill Grant, and Norm Komich. This part of the DVD runs for 45 minutes. Roland Kickinger posing at his peak from the Iron Man Pro Invitational. Kenny Kassel's interview with Arnold's close friend the legendary "Brown Bomber" Leon Brown. Leon was an early training partner of Arnold and Franco. See rare footage of Franco Columbu lifting huge weights. This segment on Franco has not been seen on video or DVD before. Kenny's interview with Richard Baldwin. When Richard is talking, you will see a clip of Richard posing at his peak from the Baldwin Super Tape. 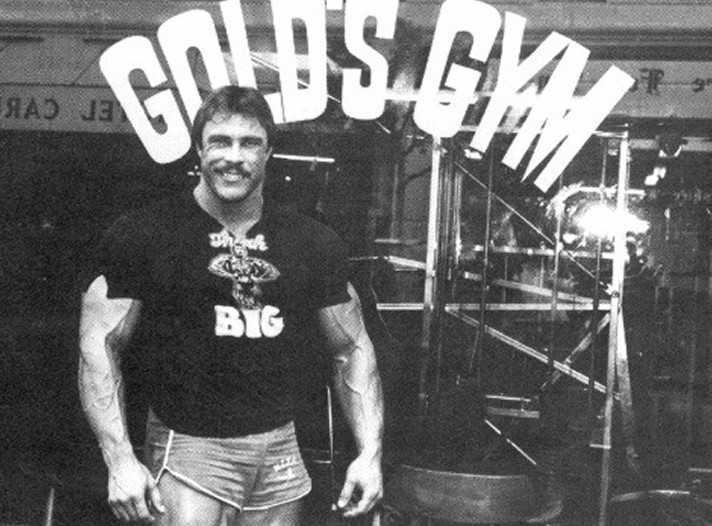 Wayne's 2006 interview with Pete Grymkowski and Ed Connors on the history of Gold's Gym and the Golden Years of the ' 70s in CA. See an insert of Pete Grymkowski posing at his peak plus other inserts. Pete is pictured above. 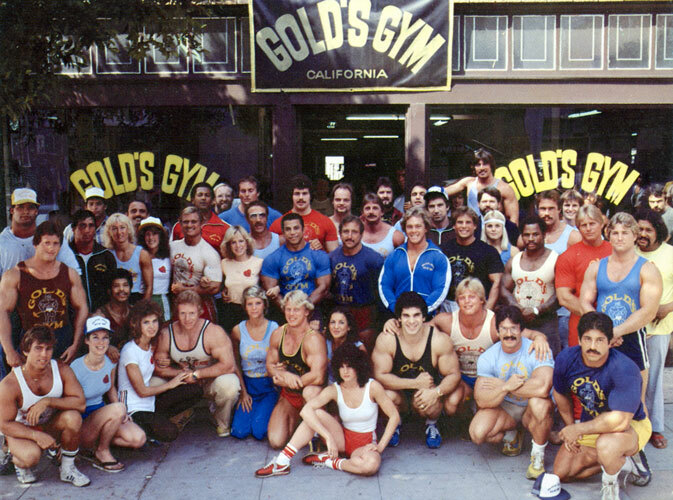 1979 Original Gold's Gym Group Shot is shown below. Kenny Kassel's interview with Dennis Tinerino, Bill Grant, Jerry Brainum, Pat Lanzillo and Mike Torchia at 2006 Iron Man FitExpo. Dennis is pictured right. Hear them talking about the early training days in Brooklyn. This hilarious interview and the Pete and Ed Connors interviews are absolutely priceless gems from the Golden Age of Bodybuilding. See more of Pete Grymkowski in Classic Collection #8, GMV-331DVD. Plus the Ironage Dinner PHOTO GALLERY with photos by John Corlett and Wayne & Tina Gallasch. Please click here for the LEGENDS REUNION AT WORLD GYM - 2 DVD SET, GMV-444DVD. I received the Ironage DVD today and I gotta say....I am speechless! You did a brilliant job and with the extra's captured the essence of everything we were trying to achieve. The section with Tinerino and friends particularly summed everything up. That's what it was like with everybody coming together again. I received the Ironage Reunion DVD today and watched it immediately. I loved it! You did a masterful job of filming and Sean's editing caught the essence of what the dinner was all about. The "extras" are fantastic and are what makes the DVD worth every penny of the cost. Thanks again for taking the time and making the effort to put all this together. I hope you and Tina can make next year's dinner. Dinner is on us this time! I will watch the DVD again and post a review of it on Ironage this weekend.